SAIC-GM-Wuling Automobile (SGMW) has renewed its confidence in Fives for the supply of RapidCharge® filling machines, in the scope of the renovation of lines B and C of its West Plant factory in Liuzhou. A joint venture between the General Motors group, SAIC Motor, and Liuzhou Wuling Motors, SAIC-GM-Wuling makes and supplies two ranges of vehicles: Wuling small utility vehicles, and Baojun cars. A reference on the Chinese automotive market since 2002, SGMW produces 2 million vehicles per year at its 10 production sites in China. Fives and SGMW have worked together in the past with great success, most recently in 2015 at the Baojun II site. This involved equipping two lines with two mobile brake, air conditioning, cooling stations as well as a pumping station for each line. 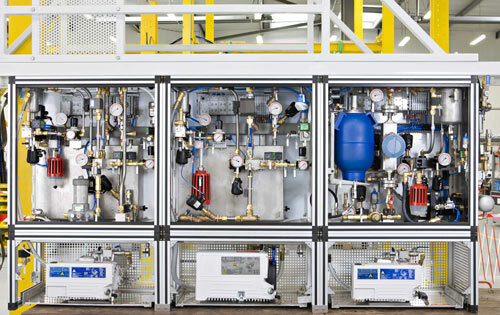 The project in Luizhou is quite similar, involving the supply and installation of 4 RapidCharge® M multi-process (brake, air conditioning and cooling) filling machines, as well as two pumping units; these machines will be produced entirely in France, at the Bignon site. With this order, SGMW confirms its confidence in the reliability of RapidCharge® equipment, acquired over more than 10 years now!